Cavan will contest their fifth Ulster Under-21 Football Championship final in a row following Wednesday's comfortable 1-7 to 0-4 victory over Monaghan. Michael Argue's 49th minute goal brought the Breffni county, so dominant at this grade, to within one game of a fourth provincial title in succession. In the 9 April final, Cavan will face Donegal who beat Armagh 0-15 to 0-10. By coincidence, Donegal were the last team to beat Cavan in the championship - back in the 2010 final. Cavan rarely looked troubled by Monaghan at the Athletic Grounds, once they settled after a slow start. Monaghan dominated possession in the first 15 minutes but hit five wides in that spell, the first three of those coming before Christopher McKenna's opening free after 11 minutes. Cavan scored two quick-fire points late in the half from Hayes and Bouchier (free) before Paudie McKenna's long-range point ended Monaghan's 19-minute wait for a score to leave them 0-3 to 0-2 behind at the break. Cavan free-taker Kevin Bouchier struggled with his free-taking in the conditions but Darragh McVitty's point put them 0-5 to 0-3 ahead after 42 minutes. Cavan scored a goal after 49 minutes when Monaghan's sub goalkeeper Darren McDonald lost the flight of the ball in the air and allowed Argue's long attempt at a point to drop into the back of the net for a fortunate goal. Christopher McKenna reduced the deficit with a free after 52 minutes, Monaghan's first score since Brian Greenan's point 18 minutes earlier, but the Farney county failed to get the ball into the scoring zone often enough to hurt Cavan, who finished strongly with points from subs Alan O'Hara and Ciaran Byrne. Subs: C McCarthy for McGurk (9), D McDonald for Kirk (38), D Freeman for McMahon (42), D Ward for Cromwell (47), R McAnespie for Conlon (58). 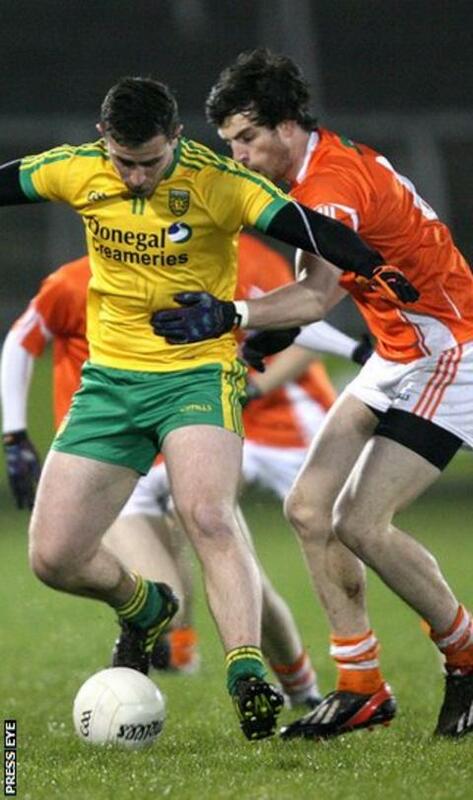 Donegal, inspired by the brilliant Paddy McBrearty, qualified for their third Ulster Under-21 final in five years with a five-points win over Armagh at Breffni Park. Senior star McBrearty hit eight points to secure a clash with holders Cavan in the decider. Donegal centre-back Ryan McHugh grasped every opportunity drive forward, opening the score in the first minute when with a little more composure he could have had a goal. While Armagh got their defensive system organised, there was little they could do to prevent McBrearty from firing over a couple of delightful points. McBrearty added two more from frees, but there was never more than a point between the sides throughout the opening quarter, with Ciaron O'Hanlon, Miceal McKenna and wing-back Joe McElroy scoring to keep the Orchard men in touch. Donegl scored four on the spin during a dominant spell and were 0-7 to 0-4 ahead at the interval. Armagh enjoyed a productive spell with three points on the spin, including a gem from McKenna, but with Donegal dropping more men back into defence, the Orchard task became all the more difficult. Flying wing-back Martin O'Reilly claimed his second, sub Darach O'Connor also landed a tidy point, and that man McBrearty killed off the challenge of Stevie McDonnell's side. Donegal: J Coll, C Brennan, C Parke, A McCloskey, M O'Reilly (0-2), R McHugh (0-3, 2f), G Gallagher, H McFadden, C Thompson (0-1), D Mulgrew, W Gillespie, E Doherty, J O'Malley, P McBrearty (0-8, 4f), E McHugh. Armagh: D O'Hagan, D O'Neill, S Kelly, C McCooey, D O'Hagan, M Murphy, J McElroy (0-1), A Findon, B Malone, P McGeown (0-2, 2f), M McKenna (0-2, 2f), C Cumiskey (0-2, 2f), E English, C O'Hanlon (0-3), J Hall. Subs: C Hoey for Murphy (37), C McKenna for Hall (41), P Crilly for O'Hagan (49), F Burns for McCooey (49), J Grugan for English (53), M Carson for Carson (56).